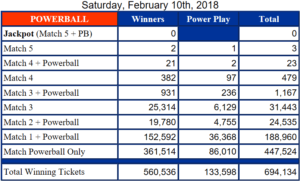 The US Powerball seems to be building up to yet another massive payout as the draw last February 10 ended in a rollover. The grand prize was supposed to be $184 million—a result of several weeks’ worth of rollovers—but will increase to an estimated $203 million, with a cash option of $120.8 million. While nobody won the grand prize, there were 3 lucky players who matched all 5 numbers. One of them had the Power Play activated, which means they get to go home with $5 million instead of $1 million. As for secondary wins, there were a total of 694,134 winners, with 23 scooping up the third prize and 479 winning the fourth prize. A US Powerball winner from New Hampshire is fighting to remain anonymous but her efforts may be doing more harm than good. The woman—who won $560 million—immediately signed her name at the back of the winning ticket but learned that she could have used a trust to protect her privacy instead. She has decided to take her case to the court in the hopes of maintaining her anonymity. Unfortunately, according to the New Hampshire Union Leader, the anonymous woman—who identified as Jane Doe in court—is losing approximately $14,000/day in interest every time a resolution is delayed. To make matters worse, if someone files a Right to Know request, lottery officials said that they would be compelled to reveal details about the currently anonymous winner. Her lawyers think otherwise because, as far as they are concerned, her privacy far outweighs the public interest. Lottery officials, upon consulting with state lawyers, were adamant that the winning ticket must be processed as they would any other ticket. Time will tell if the woman remains a Jane Doe. The Mega Millions jackpot rolled over once again following the February 9, 2018 draw where no grand prize winners were found. That means the jackpot will now jump up to an estimated $153 million (from $136 million) for this Tuesday’s draw. Meanwhile, 3 players won the $1M second prize. Had any of them played the Megaplier, they would have gone home with $3M instead. Overall, there were 239,658 players who won at least $4 each. A new bill in Trenton, New Jersey is seeking to slow down the NJ Lottery’s popular keno-style Quick Draw game. Currently, the Quick Draw game holds draws every five minutes—a figure that worries lawmakers because it veers closer to casino games than lotteries. Assemblymen Ralph Caputo and Vincent Mazzeo are looking to reduce the game’s draws to just twice a day. Throughout December last year, the Quick Draw game earned $12.6 million and it is projected to earn $20 million this fiscal year. It’s unclear exactly how much the new bill will affect lottery sales though it’s not far-fetched to say that sales might just drop. Last Friday’s Euromillions draw ended in yet another rollover. While that means nobody will go home with the £113 million grand prize, it also means that the jackpot will now be an estimated £121 million this Tuesday, February 13. One winner from the UK did, however, end up winning big by matching 5 numbers and 1 Lucky Star. The lucky player will be taking home £1,168,902.90. Meanwhile, a total of 8 third prize winners will be splitting the £136,125.20 prize, with each taking home £34,031.30. Overall, there were 2,740,712 winners during the February 9 draw. A man from Port Huron, Detroit has been charged with theft after stealing a lottery dispensing machine for scratch-off cards. 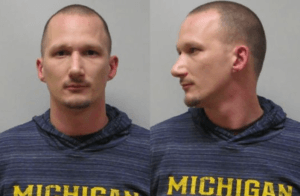 Russell Julius Spruytte, 31, was caught on the Speedy Q gas station’s surveillance cameras breaking the glass doors and walking off with the lottery machine at around 2:45 a.m. last February 2. Investigators noticed that somebody was cashing in winning lottery tickets at various businesses, so they decided to follow the lead. The trail led them to Warren, then to Port Huron—and then, directly to Spruytte. By February 6, the police had their suspect under surveillance. It was during the surveillance when investigators saw Spruytte and his girlfriend dumping a large garbage bag in their apartment complex’s dumpster. Upon retrieving the garbage bag, investigators found hundreds of scratch-off cards—all of which were confirmed to have been stolen from the gas station. On that same day, police arrested Spruytte and found additional evidence in his apartment. His girlfriend was also arrested.